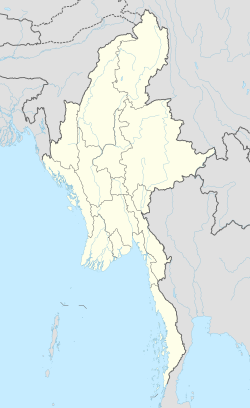 Maungdaw (Burmese: မောင်တောမြို့; MLCTS: maung:tau mrui., pronounced [máʊɴdɔ́ mjo̰]) is a town in Rakhine State, in the western part of Myanmar (Burma). It is the administrative seat of Maungdaw Township and Maungdaw District. Maungdaw is a town of Myanmar and borders Bangladesh. Maungdaw is 16 miles away from Buthidaung. The two towns are separated by the May Yu Mountains and are connected by two tunnels built in 1918. British troops stand at the entrance to the Maungdaw-Buthidaung road captured by the Allied 15th Corps in January 1944. In 2012-June-10, following border attacks by Arakanese insurgents, reports emerged of ARSA conducting "mass arrests, torture, the burning of villages, killings of civilians and destoried many pagodas." Approximately 50 villages in Maungdaw was destroyed in the violence. In 2008, the population was nearly 400,000 people. The majority of the populace, about 80%, are Rohingya people, who are considered by Myanmar government as stateless Bengali people. The Burmese government does not accept Rohingya on its list of ethnic groups of Myanmar, and thus does not recognize their claim on Burmese citizenship. The remainder of the populace consists of a wide range of ethnic groups, including Rakhine, Bamar, Daingnet, and Mro. As of 2011, there are eight high schools, 10 middle schools, 16 post-primary schools and 125 primary schools. Maungdaw has conducted trade with the Bangladeshi town of Teknaf since September 1995. ^ "Rohingyas are not citizens: Myanmar minister". The Hindu. 30 July 2012. Retrieved 20 November 2018.